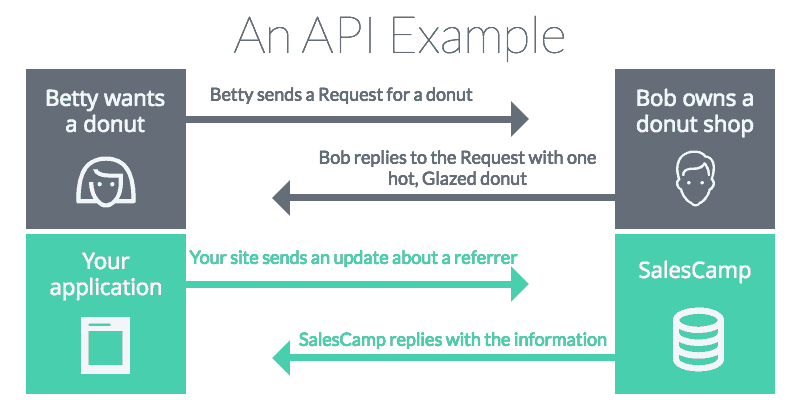 Today we at SalesCamp are very excited to announce the release of our RESTful API. Don’t worry, if you’re not a technical person, that’s ok…in this article we will break down everything about what an API is, and why you should care as a business owner when it comes to your referral marketing programs. In the simplest terms, an API is an agreed-upon way for software programs to communicate. An API (or Application Programming Interface) is a clearly defined set of rules that allows communication between software components. In plain English this lets your system talk to ours. Just as in this example, when your website or application has information it needs or wants to send to another application it does this via an API. In turn, the other application (SalesCamp in this case) sends the answer to that request back to your site/app. Why we need an API? One thing we’ve learned after talking with dozens and dozens of customers is that nearly every referral program is different. And these programs are different to fit the needs of the business, existing customers, and brand champions. And as a result, the referral marketing software that companies use needs to be equally as powerful, and as flexible, to meet those demands. The SalesCamp referral widget and embeddable overlays are a great way to get a referral program started on your site in just a few minutes. And for many of our customers, this works great “right out of the box”. However, if you run a custom web application, a marketplace, or other types of websites that are more customized, or have specific needs, then you need more customization for your referral program. That is where an API comes in. So you do marketing for a SaaS (software as a service) web application (like our friends at Hubstaff) and you want to set up a referral program for every one of your users. Sounds like a great use for an API. All these things are possible via the SalesCamp API, and with just a few lines of code. Whether you’re a developer or have a development team who would be handling this for you, check out our API Documentation for more details. Create a referral account for every user after they “activate” on the network – whatever that action is for your marketplace: creating a profile, posting a picture, the first purchase, or making a new connection. Encourage those new “active users” to share your awesome marketplace with their friends. This is the key: you want to place the referral message immediately after the user has received value from your tool. The proverbial “Aha moment” in their customer journey. Grant rewards to both the referrer and the referral upon completion of the Goal in your system. This can be anything from a cash reward to credits on your platform, to cool company swag. Everyone loves swag, right? Because of the importance of network effect in marketplaces getting as many highly engaged users as possible is essential. This is why networks like Facebook and Twitter almost require that you add a certain number of people before you can get into the platform. An empty screen is no fun to start with. Automatically enroll each new customer in your referral program as soon as they make a purchase. Send a follow-up email 2 days after the purchase to remind your happy new customer of the referral program and the massive coupon code or store credit that they will receive for each person they refer over. As they say, the world is your oyster here. With the power and flexibility of the SalesCamp API you can configure and customize each step of the referral program to exactly what your business (and more importantly your customers) needs are. If eCommerce is a very transactional relationship then many services businesses are the exact opposite. Especially when it comes to high priced consulting services there is a great deal of research that goes into choosing a service provider before you get to work together. Here maybe more than ever a trusted referral from a friend or coworker does wonders. Creating custom Goals for your referral campaigns for different offerings in your business. Set a different target for referrers to shoot for when sending over new leads to your business. Intermediate goals for new leads. The purchasing decision in many services businesses is weeks and months, not days. So it might make sense to rewards a referrer for having someone book a demo call with you. Not necessarily making the final purchase or signing a consulting agreement. Awarding different rewards for different types of goals. Just like no two services are the same, no two sets of rewards should be the same. With the SalesCamp API you can configure your Referral Program to fit in exactly with the needs of your business, your customer journey, and your sales cycle. So what about the existing tools like the awesome SalesCamp widget that you can place anywhere on your site? Great news, it’s not going anywhere, and for many customers this is still an integral part in their referral program. Just because you might choose to auto-enroll your users in your referral program via the API this does not mean that non-users (or shoppers who are not customers yet) shouldn’t be able to participate in your program too. The same goes for your brand champions. Maybe they’re not customers (yet!) but want to spread the word about how great your business is. The SalesCamp widget lets them easily enroll into your referral program with just their email address, and get started sharing the good word. Whether you’re looking for a referral marketing program that works great right out of the box, or one that’s completely customizable to fit your website and business then check out SalesCamp today. Start your free 14-day trial today and start creating referral campaigns, interact with our API, and see the power of referral marketing for yourself.